Is your phone is ready for Windows 10 Mobile? Use the Windows 10 Upgrade Advisor app to see if your Windows Phone 8.1 is eligible to update to Windows 10 Mobile. It can also help free up space on your device in order to download the update, if necessary. Swipe left to All apps. Search for the Windows 10 Upgrade Advisor app, and install it on your device. For Lumia smartphone and Windows 10 Mobile support, you can refer to the Microsoft device support page or contact Microsoft customer support at (888) 665-4228. Before checking if your device is eligible for the Windows 10 Mobile update, please make sure your battery is fully charged. If possible, leave your device connected to your charger during the update. The Windows 10 Upgrade Advisor app will determine if your Windows Phone 8.1 device is eligible to upgrade to Windows 10 Mobile. If it is, it can also help free up space on your device so you're ready for the upgrade. On Windows Phones, tap Start, swipe to the All apps list, and then tap Store. Search for the Windows 10 Upgrade Advisor app, and then install it on your device. Open the app on your device. The app determines if your device is ready for the upgrade, if an update is required before you can get the upgrade, or if your device can't be upgraded. What will I see when I run the Windows 10 Upgrade Advisor app? When you run the Windows 10 Upgrade Advisor App you may see one or more screens that resemble the following. You may see additional screens if you have to free up space on your device. If you run the Windows 10 Upgrade Advisor App, and an update is available, you’ll see a screen that resembles the following. Tap Enable Windows 10 upgrade, then tap next to start downloading. 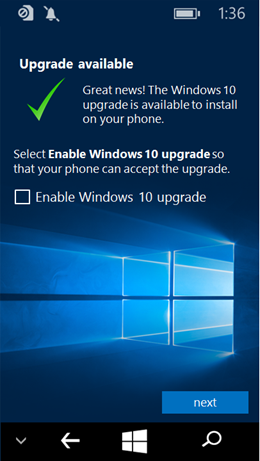 IMPORTANT: You must tap Enable Windows 10 upgrade, then tap next to start the update. On Start, swipe over to the All apps list, and then tap Settings > phone update. Tap check for updates to see if any updates are available. If you run the Windows 10 Upgrade Advisor App and an update is not available for your device at this time, it may be available in the future. If the Windows 10 Upgrade Advisor App determines your device can't be updated, tap the link to see the newest devices using Windows 10. If the Windows 10 Upgrade Advisor App determines an update is not currently available for your device, but there are plans to make one available for in the future, you'll get a notification when the update is ready. After completing your Windows 10 Mobile update, future app updates will occur in the background. Go to the Microsoft Store and check the 'Downloads' status to monitor the completion of these updates. Depending on the number of installed apps needing updates, this could take some time to complete. Note: The availability of Windows 10 Mobile as an update for existing Windows Phone 8.1 devices will vary by device manufacturer, device model, country or region, hardware limitations, and other factors. El Windows 10 specifications page has compatibility and other important installation information. 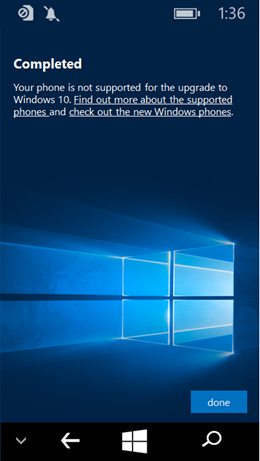 Learn about the Windows 10 Mobile OS it’s great features. To view the software version your Microsoft Lumia 735 is running, check out this info. © 2018 Nokia. Todos los derechos reservados. © 2018 Microsoft Corporation. Todos los derechos reservados. Microsoft, Windows y el logotipo de Windows son marcas comerciales del grupo de compañías Microsoft.